Was Joe Jackson guilty of conspiring to fix the outcome of the World Series? 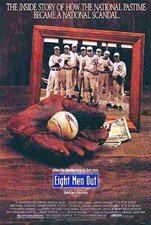 Writer/director John Sayles rich drama chronicles the true-life story of baseball's infamous "Black Sox" scandal, when eight players on the 1919 Chicago White Sox, embittered by their low pay, made a deal with gamblers to throw the World Series. Charlie Sheen, John Cusack, D.B. Sweeney, Michael Lerner, and Christopher Lloyd star. 120 min. Widescreen; Soundtracks: English Dolby Digital 5.1, Dolby Digital mono, Spanish Dolby Digital mono, French Dolby Digital mono; Subtitles: English, Spanish; audio commentary; documentary; featurettes. Biographical information, quotations, career highlights and pictures. This site is devoted to the memory of Shoeless Joe Jackson and the movement to persuade Major League Baseball to remove Joe Jackson from their ineligible list, thereby making him eligible for election to the National Baseball Hall of Fame.